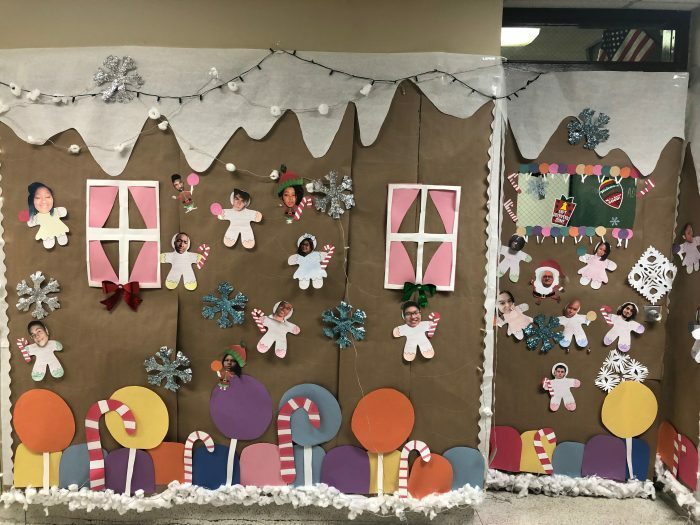 Every year around Christmas time, Hudson Catholic holds a door decorating contest to get everyone in the holiday spirit. Each homeroom puts their blood, sweat, and tears into decorating these doors and it gets really competitive. Students and teachers try their best to top last year’s design and it pays off every time. The doors last year included designs inspired by classic Christmas symbols such as The Grinch, a Nutcracker, Gingerbread houses, Christmas Trees, etc. This year, the contest included designs from loved holiday movies, doors wrapped in cheerful paper, and one popular design was one of a holiday fireplace with stockings hanging over it. However, the door that won the contest this year had an interesting spin to it. Deacon Karal’s senior homeroom definitely went big for this year’s contest. They expanded their homeroom door and took over a row of lockers to add to their Gingerbread house design. The results were Deacon Karal with 1st place, Ms. McGady with 2nd, and Ms. Rosales in 3rd place. The Commentator asked students in Deacon’s homeroom how they felt about snagging the top prize. “We just got more creative than the other homerooms and decided to use lockers as well. The bigger the better!” said senior John Arakelian. Of course, no win comes without controversy. The Commentator spoke to senior Bernard Guzman of Mr. Bongiorno’s homeroom, who told us he was actually really sad about the contest. This year’s door decorating contest got a lot of attention and hopefully it continues to grasp people’s attention in the Christmases to come.